According to Aistear, there are subtle differences between the meanings of the Irish words clann, teaghlach and muintir. Irish clans were composed of those who were related by blood but also by those who were adopted and fostered into the clan as well as those who joined the clan for strategic reasons such as safety or combining of lands and resources. However, all members of the clan bore the same surname. membership of an Irish Clan is based on one's inherited and chosen identity and not on bloodline descent alone. Statistically, we are almost certainly all descended from Brian Boru (d.1014) (and from every other Irish person of his generation who has living descendants today). Why? 20 generations ago, around 1400AD, we all have over a million slots to fill on our pedigree charts. 30 generations ago, around Brian Boru's time, we all have over a billion slots to fill on our pedigree charts. I estimate that there is about a 95% chance that any pair of individuals in the audience are 12th cousins or closer. For more on these topics, see here. Why do we feel a closer connection to people who share our surname? This is the same inheritance path as followed by surnames. Brian Boru's Y chromosome survives virtually unchanged in his male line O'Brien descendants today. On average 25% comes from each grandparent, on average 12.5% comes from each greatgrandparent, and so on. Very little of Brian Boru's autosomal DNA has survived this recombination process intact in his countless living descendants today. Do you know who would share your surname if surnames were inherited matrilineally instead of patrilineally? Our greater affinity with those who share our surname than with those who share our mitochondria is a strange mixture of a genetic connection (the Y-chromosome) and a linguistic connection (the surname). Pairs of third cousins may occasionally not share any autosomal DNA. Pairs of thirtieth cousins in the direct male line always share Y-DNA, and often share a surname. Men with an interest in their surname history should not only join the relevant surname or clan group, but should also submit a DNA sample for Y-chromosome analysis. a husband, son, brother-in-law, father-in-law, etc., if her interest is in her married surname. The Y-chromosome, like the surname, is passed virtually unchanged from father to son, with just occasional mutations or mistranscriptions. Over tens of thousands of years, these occasional mutations add up to give a wide distribution of different Y-DNA signatures today. A single-nucleotide polymorphism, abbreviated SNP and pronounced snip, is a single location where there is a relatively high degree of variation between different people. For example, most people may have an A at one such location, with a minority having a C.
A short tandem repeat (STR) is a string of letters consisting of the same short substring repeated several times, for example CCTGCCTGCCTGCCTGCCTGCCTGCCTG is CCTG repeated seven times. The number of repeats may occasionally increase or decrease between parent and child, due to mutations. Many SNPs are once-in-the-history-of-mankind mutations. These mutations have occurred exactly once. Every man descended from the man in whom the mutation originally occurred inherits the mutation. No other man has the mutation. The "biblical Adam" was the first and only male in the world at the time of creation. The "genetic Adam" or "Y-Adam", the most recent common patrilineal ancestor of all men alive today, was merely the only male in the world in his day whose male line descendants have not yet died out. Y-Adam is estimated to have lived between 160,000 and 300,000 years ago. All R-DCxxxx SNPs are descendants of R-L226. 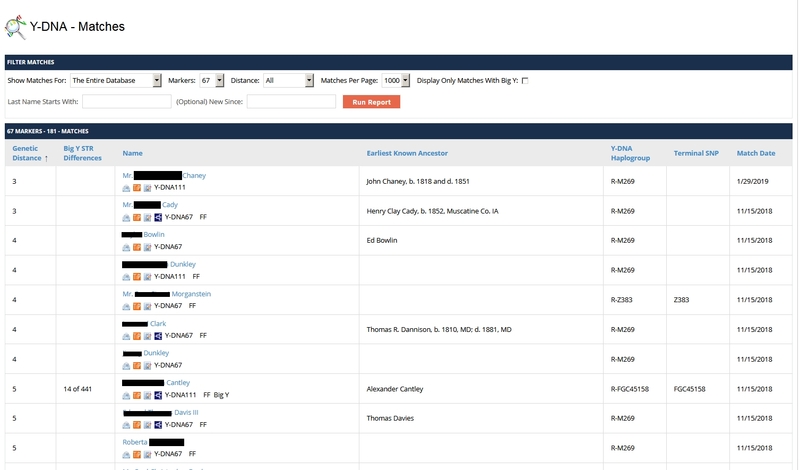 Results can be copied (free of charge) from FamilyTreeDNA.com to The Big Tree. FamilyTreeDNA.com has recently introduced its own version of The Big Tree, called the Big-Y Block Tree. 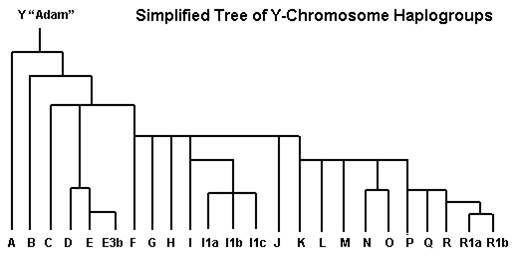 All Marrinans are R-BY19489+ and vice versa (Big Tree branch; FTDNA Marrinan project). O'Dea and O'Brien clans fostered each other's children in mediaeval times. Was there a surname/DNA switch? Did an O'Brien child fostered by the O'Dea clan take the O'Dea surname? "Thomas Fitz Garrolde [Fitzgerald], alias Adaye [O'Dea], Grutchins, Co. Kilkenny, gent." received a pardon in 1566. Did Thomas O'Dea of Gorteens adopt his wife's surname [Fitzgerald] on occasion out of political expediency in his dealings with the Tudor government, or did he have a Geraldine pedigree after all, which was revised by such a marriage? Thomas's descendants certainly used the Fitzgerald surname. DNA answers Walsh's question about the true genetic surname: there was a surname/DNA switch in the 1500s. A man's place (or a surname's place or a clan's place) in the human family tree, or his DNA signature, is now generally described by the most recent confirmed SNP, misleadingly described as the terminal SNP. additional more recent once-in-the-history-of-mankind SNPs (for which he is positive) may subsequently be discovered. SNPs and STRs can be combined into mutation history trees. SNP comparisons make it very easy to find relationships between surname groups. SNP differences trump STR results regarding how closely two men are related to one another. STR comparisons remain useful for estimating relationships between men with the same surname and/or with the same terminal SNP. So an STR product is still the entry-level purchase for most men. Y-DNA37 can be ordered at a discounted price (currently USD149) through a FamilyTreeDNA project, for example (if you have ancestors who lived in County Clare, Ireland) the Clare Roots project which I administer. Patterns of STR values were the original DNA signatures of surnames and clans, but have been replaced by the more definitive SNP signatures. SNP comparisons can prove or disprove relationships beyond a reasonable doubt. STR comparisons can prove or disprove relationships on the balance of probabilities. Patterns of STR values can still be used to predict SNPs. 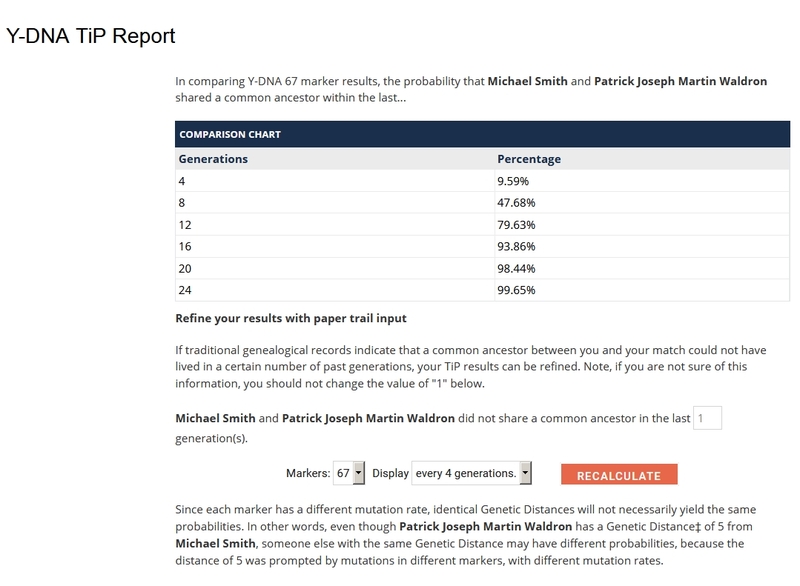 Comparisons of patterns of STR values is still the main method used by FamilyTreeDNA.com to identify Y-DNA matches. In principle, your match list should contain dozens of men with your exact surname. your close relatives may have reverted to an ancient spelling of your surname discovered in their research. My Y-DNA111 matches as of 11 February 2019. My top Y-DNA67 matches as of 11 February 2019. DNA provides only crude estimates of the number of generations to the most recent common ancestor of two men. The TiP calculator estimates the number of generations to the most recent common male line ancestor of two STR matches. The equivalent rule-of-thumb for the SNP block trees is roughly one mutation per century. 11? different most distant known ancestors. All 12 match on 33 of the first 37 STRs. All 6 match on 73 of the last 74 STRs. There is one known Marrinan man who took his surname from his mother but is not yet in the project. The Carroll project is an example of a multiple-origin surname with a wide variety of SNP and STR signatures. Once you have your initial Y-DNA results (or a known male-line relative's Y-DNA results), you can join appropriate haplogroup projects. You must Opt in to Sharing on the PROJECT PREFERENCES page or your pseudonymized DNA results and ancestor information will be missing from the public results pages. You can also choose from that page whether to give each project administrator Minimum, Limited or Advanced access to your kit; reducing access to Minimum pretty much eliminates all the benefits of project membership. It is also recommended that you set Y-DNA Match Levels to All Levels on the PRIVACY & SHARING page. The first prerequisite (thanks to GDPR) is to have an e-mail address which you are prepared to expose to spammers and to other non-FTDNA customers; you may wish to establish a new e-mail address specifically for this purpose. Wikipedia defines a data breach as "the intentional or unintentional release of secure or private/confidential information to an untrusted environment". My long-standing guidelines on e-mail etiquette demand that my correspondents "please do not publish my e-mail address on any web page, news group, chat room, etc." If you are an ordinary customer of FTDNA, only your matches can see your e-mail address. If you are an FTDNA project administrator, everyone on the internet, whether an FTDNA customer or not, sees your e-mail address. This is part of the FTDNA Terms & Policies. If there is no surname project for your surname and you are happy to deal with the spam risk, then you can apply to set up your own project by following a simple five-step application process (which actually consists of only four steps!). Every project has an activity feed for discussions between members and administrators, which can be used by administrators to avoid having to answer the same frequently asked questions repeatedly via individual e-mails. Many of the colours available for distinguishing subgroups don't work very well, or at least my eyesight isn't good enough to use them, as the background colours are too close to the text colour. 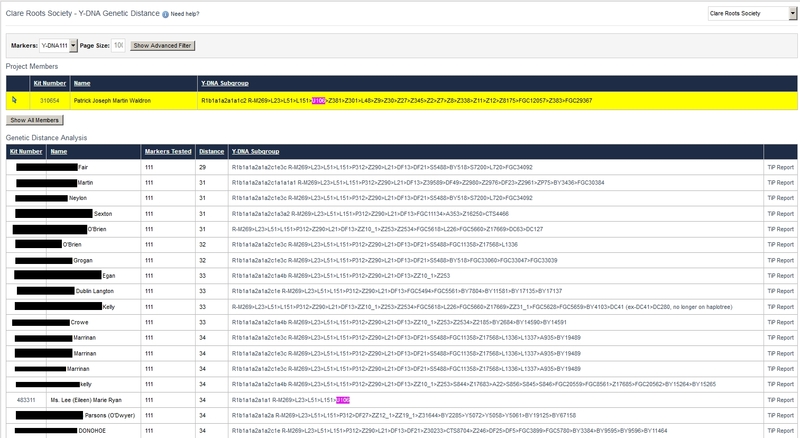 Subgroup Names (which are visible on the results pages) appear to be truncated at 161 characters, without warning. So keep these names as short as possible with no unnecessary spacing or punctuation. Subgroup Descriptions (which are visible to the project administrator(s) only) appear to be truncated at 973 characters, without warning, and despite the false assurance of scroll bars in the editor. examples: R-M222 for a man with one Y-DNA37 match with no SNP test; R-FGC29367 for a man with no Y-DNA111 match. FTDNA will send an e-mail on behalf of an administrator, no more than once every six months, to all customers with the relevant surname who have opted to receive such e-mails. Administrators can see project members' matches and can e-mail them directly to invite them to join. Your clan organisation is ideally positioned to run online and offline recruitment drives. The value of DNA "testing" to genealogists increases dramatically with the number of people with the relevant surname already in the DNA databases used. But your money is better spent on advanced testing for one man than on duplicate testing for two known close relatives. for men with a surname/DNA switch from your surname to another surname somewhere in their lineage. We need to persuade more Irish men to submit Y-DNA samples to the databases for purely genealogical purposes. All of your descendants will be eternally grateful to you for leaving them a sample of your autosomal DNA. Your female descendants will be eternally grateful to you for leaving them a sample of your Y-DNA. Only if you have produced male-line descendants are you absolved of your personal responsibility to preserve and record your own Y-DNA for posterity.